Prepare to be amazed... and to be amazing! 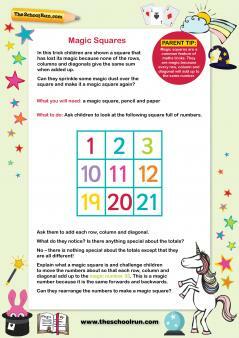 TheSchoolRun's Magic Maths learning pack is bursting with brilliant number tricks to puzzle over, learn and perform. Why not show off your X-Ray eyes and look through dice like an X-Ray machine? 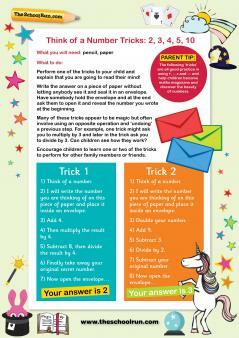 You can also try your hand at finger multiplication or have a go at a magic jigsaw. Add enormous numbers at lightning speed to great acclaim, read your audience's mind and predict the number they are going to pick, pass your whole body through a sheet of A4 paper and "memorise" hundreds of words and numbers... it's all possible once you've mastered magic maths. KS1 and KS2 pupils will love getting to grips with 30 different mathematical tricks, understanding how they work and showing off their skills to friends and family. 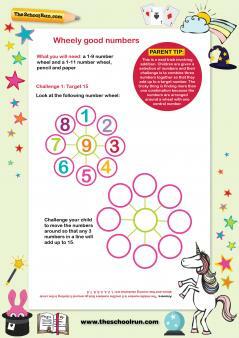 TheSchoolRun offers lots of other numeracy puzzles to help you challenge your child and engage them with some digits-based fun. 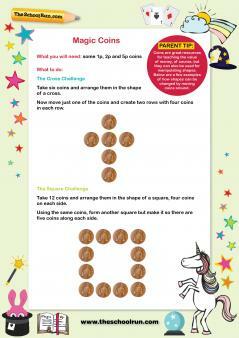 KS1 Maths Puzzles and KS2 Secret Agent Maths are aimed at kids aged 5-7 and 7-11 specifically.